I’ve provided water for my honey bees over the past few weeks by pouring water into a bowl full of marbles. It works better than anything I’ve tried before. I don’t normally concern myself with providing water for my honey bees. I live on the island of Newfoundland, one of the wettest places you’ll ever see. The bees can drink water off the soaking wet earth every other day if they’re thirsty. But a few weeks ago I noticed the bees drinking from every source of standing water around my yard. That kind of gave me the feeling they needed more water than usual. And it makes sense. The bees don’t only drink water. They also evaporate it inside the hive to help regulate the temperature of the brood, and it’s been exceptionally hot in my beeyard for the past five or six weeks. 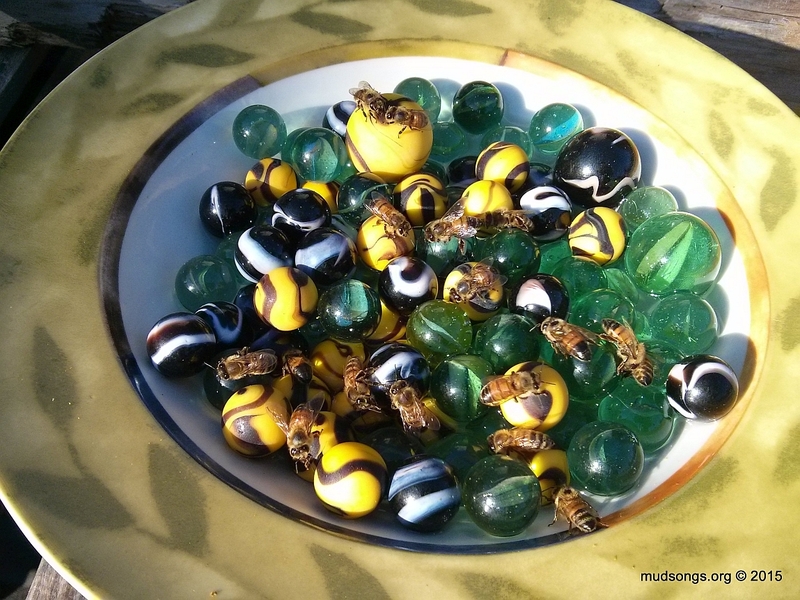 The bees have drunk from the bowl full of marbles every day since I set it up. It’s impressive how quickly they drink it down. The salt I added to the water on the first day has long since washed away and the bees don’t seem to care. That surprises me because I’ve observed honey bees drinking dirty stinking water many times in the past and I thought the briny odour, along with the minerals provided by the salt, would attract the bees. (Rachael Bonoan, a graduate student from Tufts University, is currently investigating this phenomena.) It’s possible the bees were initially attracted to the bowl by the briny odour but keep returning only because they’ve homed in on the position of the bowl. Perhaps I’ll move the bowl to a new location and see how quickly the bees discover it and see if they keep returning to it. Perhaps I’ll add a sprinkle of salt for flavour from time to time too. That’s probably not a bad idea. Whatever’s going on, the bees seemed to need more water and a bowl full of marbles did the trick. This entry was posted in Month of August, Month of September, Water, Year 2015 and tagged Practical Tips, Video. Bookmark the permalink. I just put some rocks in the dish and it keeps them well-watered for a good month.